People have used limestone in construction for thousands of years. 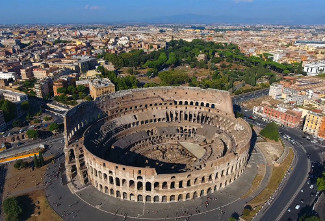 Ancient buildings like the Pyramids at Giza are made of limestone, as is the Colosseum in Rome. But limestone has many other uses in our modern world that you probably are not aware of – like in your toothpaste! 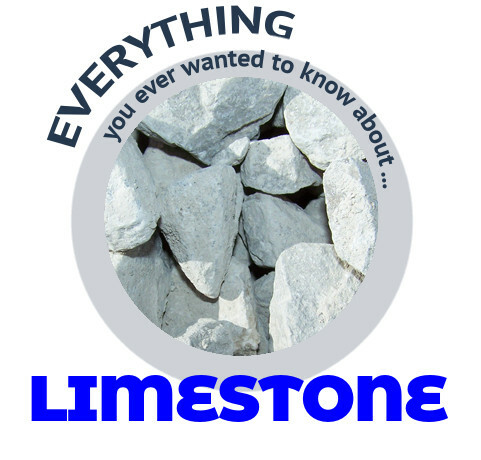 Here is everything you ever wanted to know about ... LIMESTONE! One of the most important uses of limestone is as an ingredient in cement. Although the terms cement and concrete often are used interchangeably, cement is actually an ingredient of concrete. 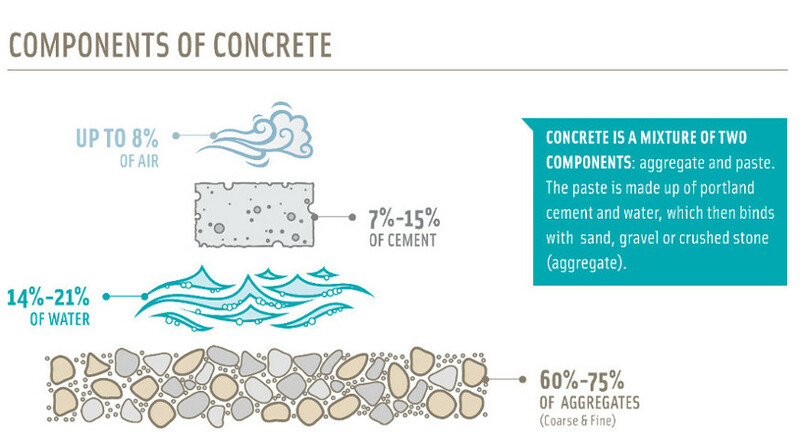 Cement comprises 10-15% of the concrete mix. Portland Cement is the most common type of cement. Bricklayer Joseph Aspdin of Leeds, England first made portland cement early in the 19th century by burning powdered limestone and clay in his kitchen stove. 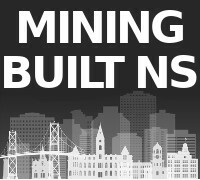 Today, Portland cement is everywhere around us in our modern infrastructure. 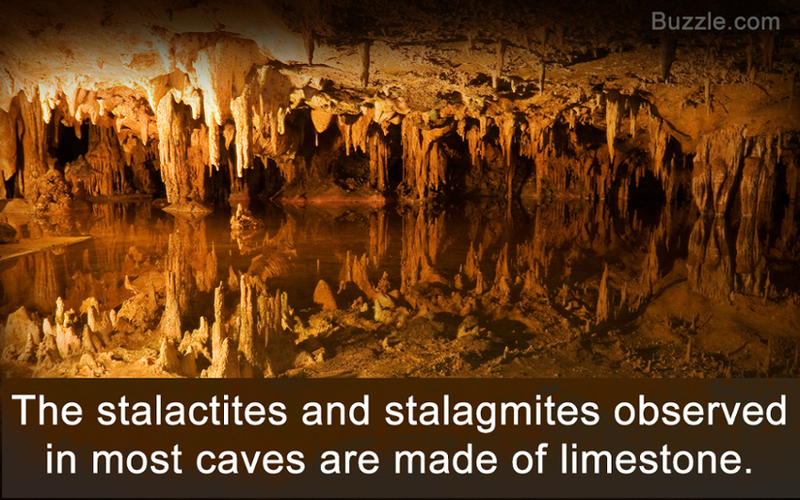 The stalactites (hanging cylindrical structures from the roof) and stalagmites (cylindrical structures sticking up from the floor) in caves are made of limestone. When the water leaves the cave it leaves limestone behind, which leads to formation of these interesting structures. This process takes thousands of years. There is rock in your toothpaste! 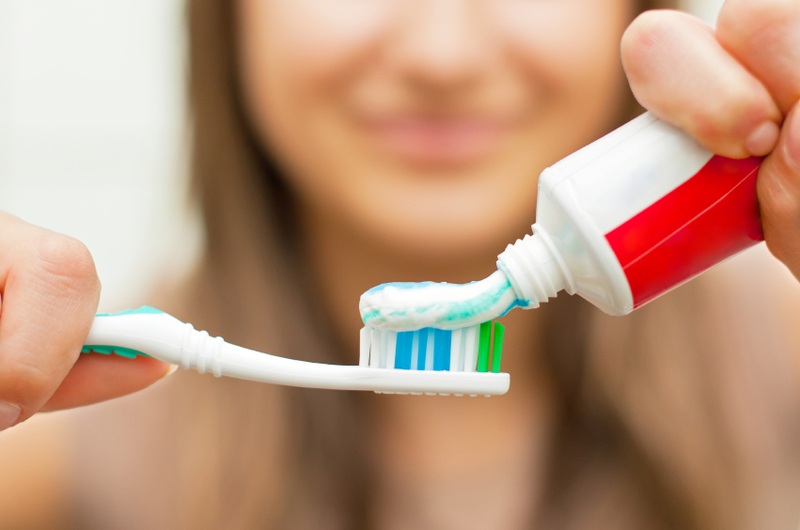 Toothpaste usually contains powdered limestone which is used as an abrasive to clean off plaque. 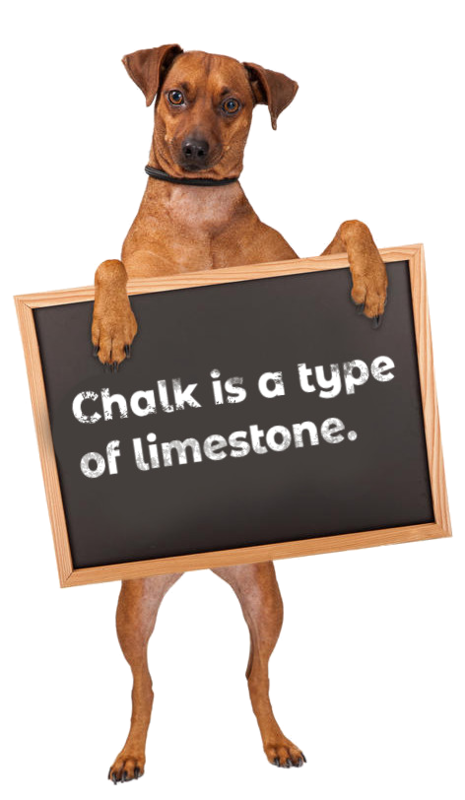 Chalk is a type of limestone that contains mostly shells from marine animals. During the 1700s, limestone was used for lithography, which is when pictures are drawn on stones and then copied to other stones. Marble is a type of limestone. Limestone turns into marble when subjected to high amounts of pressure and heat. The Nova Scotia legislature’s flooring is made of limestone and marble. The floors contain visible sea fossils because limestone forms at the bottom of the ocean over millions of years as shells and bones of marine organisms pile up. The process preserves the organisms into fossils. The Greeks and Romans recognized limestone’s unique chemical properties and used it as a bleaching agent, an ingredient in medicinal tonics and a soil sweetener in agriculture. 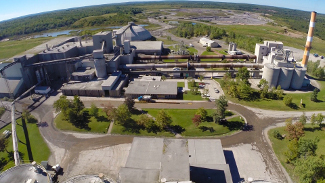 The Brookfield limestone quarry, providing a key ingredient in the cement manufacturing process. Limestone is a rock with an enormous diversity of uses. Most limestone is made into crushed stone and used as a construction material. It is used as a crushed stone for road base and railroad ballast. It is used as an aggregate in concrete. It is fired in a kiln with crushed shale to make cement. Some varieties of limestone perform well in these uses because they are strong, dense rocks with few pore spaces. These properties enable them to stand up well to abrasion and freeze-thaw. Limestone is heated in a kiln with shale, sand, and other materials and ground to a powder that will harden after being mixed with water. Limestone is often cut into blocks and slabs of specific dimensions for use in construction and in architecture. It is used for facing stone, floor tiles, stair treads, window sills, and many other purposes. Crushed to a fine particle size, crushed limestone is used as a weather and heat-resistant coating on asphalt-impregnated shingles and roofing. It is also used as a top coat on built-up roofs. Calcium carbonate is one of the most cost-effective acid-neutralizing agents. 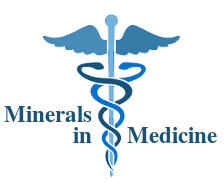 When crushed to sand-size or smaller particles, limestone becomes an effective material for treating acidic soils. It is widely used on farms throughout the world. If calcium carbonate (CaC03) is heated to high temperature in a kiln, the products will be a release of carbon dioxide gas (CO2) and calcium oxide (CaO). The calcium oxide is a powerful acid-neutralization agent. It is widely used as a soil treatment agent in agriculture and as an acid-neutralization agent by the chemical industry. Chickens need calcium carbonate to produce strong egg shells, so calcium carbonate is often offered to them as a dietary supplement in the form of "chicken grits." It is also added to the feed of some dairy cattle who must replace large amounts of calcium lost when the animal is milked. Also known as "rock dust." 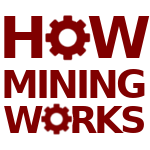 Pulverized limestone is a white powder that can be sprayed onto exposed coal surfaces in an underground mine. This coating improves illumination and reduces the amount of coal dust that activity stirs up and releases into the air.  This improves the air for breathing, and it also reduces the explosion hazard produced by suspended particles of flammable coal dust in the air. Limestone also has many other uses. Powdered limestone is used as a filler in paper, paint, rubber, and plastics. 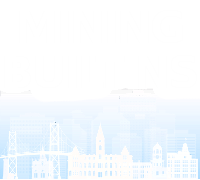 Crushed limestone is used as a filter stone in on-site sewage disposal systems. Limestone is used to make glass. Toothpaste usually contains powdered limestone which is used as an abrasive to clean off plaque. You know that relief you feel when you burp? If you drink something carbonated, you can bring that relief on. Many sodas and antacid tablets that we take for heartburn contain the active ingredient calcium carbonate, which is mined from limestone. So, the next time you take a Tums or an Alka-seltzer, remember that you’re eating a rock to settle your stomach! There is rock in your toothpaste! 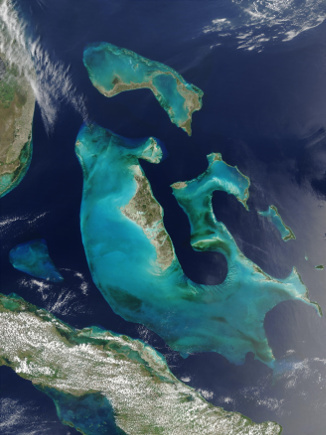 The Bahamas Platform: A NASA satellite image of the Bahamas Platform where active limestone formation occurs today. The main platform is over 100 miles wide, and a great thickness of calcium carbonate sediments have accumulated there. In this image the dark blue areas are deep ocean waters. The shallow Bahamas Platform appears as light blue. Limestone is a sedimentary rock which forms at the bottom of the ocean over millions of years. Limestone consists primarily of calcium carbonate which comes from the shells and bones of marine organisms. The sediment that builds up preserves these organisms into fossils and through extreme heat and pressure this sediment undergoes a chemical reaction that eventually turns it into limestone. Most limestones form in shallow, calm, warm marine waters. That type of environment is where organisms capable of forming calcium carbonate shells and skeletons can easily extract the needed ingredients from ocean water. When these animals die, their shells and skeletal debris accumulate as a sediment that can be transformed into limestone. Their waste products can also contribute to the sediment mass. Limestones formed from this type of sediment are biological sedimentary rocks. Their biological origin is often revealed in the rock by the presence of fossils. 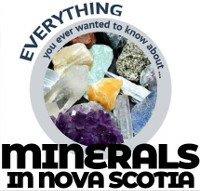 Nova Scotia’s limestone deposits were formed in inland seas that later evaporated. 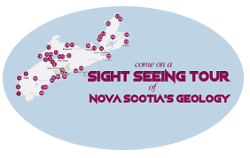 Today, these deposits are under dry land in places like Brookfield and Cape Breton. Even now, Earth has many limestone-forming environments. Most of them are found in shallow water areas between 30 degrees north latitude and 30 degrees south latitude. Limestone is forming in the Caribbean Sea, Indian Ocean, Persian Gulf, Gulf of Mexico, around Pacific Ocean islands, and within the Indonesian archipelago. One of these areas is the Bahamas Platform, located in the Atlantic Ocean about 100 miles southeast of southern Florida (see satellite image). 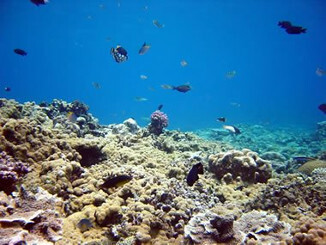 There, abundant corals, shellfish, algae, and other organisms produce vast amounts of calcium carbonate skeletal debris that completely blankets the platform. This is producing an extensive limestone deposit. There are many different names used for limestone. These names are based on how the rock formed, its appearance or its composition, and other factors. Here are some of the more commonly-used varieties. A soft limestone with a very fine texture that is usually white or light gray in color. It is formed mainly from the calcareous shell remains of microscopic marine organisms such as foraminifers, or the calcareous remains from numerous types of marine algae. A limestone that contains obvious and abundant fossils. These are normally shell and skeletal fossils of the organisms that produced the limestoe. A dense limestone with a very fine and very uniform grain size that occurs in thin beds which separate easily to form a very smooth surface. In the late 1700s, a printing process (lithography) was developed to reproduce images by drawing them on the stone with an oil-based ink and then using that stone to press multiple copies of the image. A limestone that forms by evaporative precipitation, often in a cave, to produce formations such as stalactites, stalagmites, and flowstone. A limestone produced by precipitation of calcium-laden waters at a hot spring, lake shore, or other location. The cement plant in Brookfield, Nova Scotia, which has operated since 1965. The plant’s limestone quarry can be seen at the top-right. Limestone is a key ingredient in portland cement. 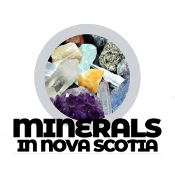 Cement has been manufactured in Brookfield Nova Scotia since 1965 and a limestone quarry on the site provides the limestone. Cement comprises from 10-15% of the concrete mix, by volume. 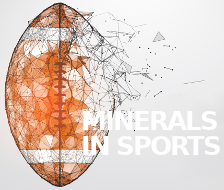 Through a process called hydration, the cement and water harden and bind the aggregates into a rock-like mass. This hardening process continues for years meaning that concrete gets stronger as it gets older. Portland cement is not a brand name, but the generic term for the type of cement used in virtually all concrete, just as stainless is a type of steel and sterling a type of silver. Therefore, there is no such thing as a cement sidewalk, or a cement mixer; the proper terms are concrete sidewalk and concrete mixer. Cement is the essential ingredient in concrete. It is a fine powder that acts as the glue that holds concrete together when mixed with water, sand and aggregates. Cement is manufactured by heating a precise mixture of finely ground limestone, clay and sand in a rotating kiln to temperatures reaching 1450ºC. This results in the production of cement clinker, an intermediate product in the manufacture of cement. The cement clinker emerges from the kiln, is cooled, and then finely ground to produce the powder we know as cement. Cement is only a small part of the recipe for concrete, typically making up only about 7% to 10% of the concrete mix. The other basic components of concrete are sand, gravel (fine and coarse aggregate) and water. The core ingredients of cement (limestone, sand, and clay) and concrete (cement mixed with sand, gravel, and water) are among the most commonly available raw materials on Earth. 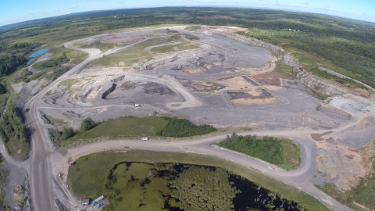 Reclaimed coal mine in Coalburn, Nova Scotia. Coal-burning plants emit sulfur dioxides into the atmosphere, which are a greenhouse gas. Limestone, applied as a slurry, which is a mixture of minutely crushed limestone and water, helps to prevent sulfur dioxide from escaping through the plant’s smokestack. The limestone traps the sulfur dioxide gas in the wet slurry with calcium and oxygen and makes the pollutant a removable solid waste. Limestone works as an amendment to soils and lawns to increase alkalinity. Acid-loving plants like camellias, azaleas, blueberries and centipede lawns grow best with a soil pH of 5.0 to 5.5. But most plants prefer a higher pH of about 6.5 to thrive. Before adding lime to the soil, test it for alkalinity by taking samples from three to five areas in the yard about 6 inches deep. Only add lime when the soil pH is highly acidic or below 5.5. Most fruits, vegetables and a large range of plants prefer soil slightly acidic or 5.5 to 6.5 on the pH scale. 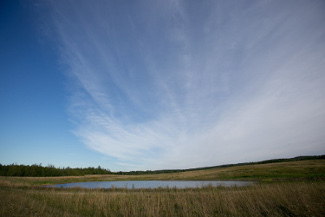 Pond liming increases nutrient availability for both fish and plants in the pond. 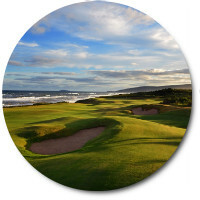 It also provides a shield against the fluctuations in the water’s acidity each day. Farmers and rural homeowners often add calcium carbonate derived from limestone to a pond’s bottom to sterilize it prior to adding fish. Calcium carbonate can also be used to de-acidify lakes and rivers and help restore the natural balance of the eco system. For homes in rural communities, many wells have acidic water that also contain high amounts of iron or ferrous byproducts. Acidic water plays havoc with copper pipes over time, which is why many people opt for water treatment tanks that contain limestone and other sands or minerals. 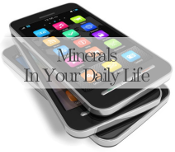 They act as a base for changing the water’s pH content as well as help to remove iron and its byproducts from the water. Water treatment tanks with automatic timers regularly backflush the nasty water collected by the limestone and other sands at the bottom of the tank and lift the sand during backflush to loosen and remove the sediments. Limestone sands and other filtration media must be changed and recharged periodically based on the water’s constituents to keep the water’s pH level at a neutral 7.0. This is best for drinking water and copper pipes.